Therapeutic options to effectively inhibit growth and spread of neuroendocrine gastrointestinal tumors are still limited. As both meta-iodobenzylguanidine (MIBG) and interferon-γ (IFNγ) cause antineoplastic effects in neuroendocrine gastrointestinal tumor cells, we investigated the antiproliferative effects of the combination of IFNγ and non-radiolabeled MIBG in neuroendocrine gut STC-1 and pancreatic carcinoid BON tumor cells. IFNγ receptors were expressed in both models. IFNγ dose- and time-dependently inhibited the growth of both STC-1 and of BON tumor cells with IC50-values of 95 ± 15 U/ml and 135 ± 10 U/ml, respectively. Above 10 U/ml IFNγ induced apoptosis-specific caspase-3 activity in a time-dependent manner in either cell line and caused a dose-dependent arrest in the S-phase of the cell cycle. Furthermore, IFNγ induced cytotoxic effects in NE tumor cells. The NE tumor-targeted drug MIBG is selectively taken up via norepinephrine transporters, thereby specifically inhibiting growth in NE tumor cells. Intriguingly, IFNγ treatment induced an upregulation of norepinephrine transporter expression in neuroendocrine tumors cells, as determined by semi-quantitative RT-PCR. Co-application of sub-IC50 concentrations of IFNγ and MIBG led to additive growth inhibitory effects, which were mainly due to increased cytotoxicity and S-phase arrest of the cell cycle. Our data show that IFNγ exerts antiproliferative effects on neuroendocrine gastrointestinal tumor cells by inducing cell cycle arrest, apoptosis and cytotoxicity. The combination of IFNγ with the NE tumor-targeted agent MIBG leads to effective growth control at reduced doses of either drug. Thus, the administration of IFNγ alone and more so, in combination with MIBG, is a promising novel approach in the treatment of neuroendocrine gastrointestinal tumors. Gastrointestinal neuroendocrine (NE) tumors represent a rare and rather heterogeneous tumor entity. Almost half of the metastatic NE gastrointestinal tumors release excessive amounts of biogenic amines and/or neuropeptides thereby causing a characteristic hypersecretion syndrome. The often bizarre clinical symptoms are generally well controlled by somatostatin analogues or interferon-α (IFNα) [1, 2]. However, further growth and spread is generally not prevented on the long by either biotherapy or conventional chemotherapy. Thus, innovative treatment strategies should be developed that are both effective and well tolerated. A promising approach for novel treatment of NE gastrointestinal tumor disease may be the modulation of the IFNγ-receptor system. The immunomodulatory lymphokine IFNγ modulates biological responses by binding to its cognate receptor thereby activating members of a transcription factor family termed STAT (signal transducers and activators of transcription) . IFNγ-induced STAT signaling and STAT-associated induction of interferon regulatory factors (IRFs) have been shown to exert key regulatory function for proliferation, differentiation and survival . The underlying mechanisms of IFNγ-induced growth inhibition show a broad spectrum, including the induction of cell cycle arrest, apoptosis and cytotoxcicity [5, 6]. Although interferons are known to evoke growth regulatory effects in many tissues, the effectiveness of IFN-induced growth inhibition varies between the various cell types. Thus, growth control observed in a given cell type does not allow to predict similar effects of IFNγ on tissues of other origin . IFNγ-induced growth inhibition in NE gastrointestinal tumors has not yet been evaluated in great detail. Here we examine the antineoplastic potency of IFNγ alone or in combination with non-radiolabeled MIBG in NE gastrointestinal tumor cells of the gut and pancreas. In its radiolabeled form the norepinephrine analog MIBG is an established diagnostic and therapeutic agent in neuroendocrine tumors expressing plasma membrane bound norepinephrine transporters [8–10]. Recently, we and others could show that even its non-radiolabeled form, the so-called "cold MIBG" can effectively inhibit the growth of neuroendocrine tumor cells [11, 12]. Since IFNγ has been reported to upregulate the MIBG-transporting norepinephrine transporter in neuroblastoma cells , it was intriguing to evaluate, whether this also held true for NE gastrointestinal tumors cells and whether such an upregulation could boost the antineoplastic potency of cold MIBG in NE tumor cells. Human pancreatic carcinoid BON cells [14, 15] were maintained in a 1:1 mixture of DMEM, and F12K medium containing 10% FCS (Biochrom, Berlin, Germany) and 1% L-glutamine. The murine intestinal neuroendocrine tumor cell line STC-1, which was a gift from Dr. D. Hanahan (University of California, San Francisco, CA), was maintained in DMEM supplemented with 15% horse serum (Biochrom, Berlin, Germany), 2.5% FCS (Biochrom) and 1% L-glutamine . The neuroendocrine-differentiated human colorectal cancer cell line Colo 320 DM  was maintained in standard RPMI 1640 medium, complemented with 10% FCS. All cell lines were kept at 37°C in a humidified atmosphere (5% CO2). IFNγ and non-radiolabeled meta-iodobenzylguanidine (MIBG) were purchased from Sigma (München, Germany). Stock solutions were prepared in water or DMSO, respectively, and stored at -20°C. The drugs were diluted in fresh media before each experiment. In all experiments, the final DMSO concentration was <0.5%. To evaluate the effects of IFNγ and/or MIBG, cells were incubated with either control medium or medium containing rising concentrations of the respective drugs. Media were changed daily to ensure constant drug concentrations in the incubation medium. Semi-quantitative analysis of mRNA expression of the human plasma membrane bound norepinephrine transporter (hNET) and the housekeeping gene β-actin was carried out by RT-PCR with the number of cycles at which the band intensity increased linearly with the amount of mRNA used . Total RNA was extracted from cultured cell lines with RNAClean following the recommendation of the manufacturer (Hybaid, London, UK). Reverse transcription and PCR reactions were carried out as described elsewhere in detail . To eliminate any possible contamination with genomic DNA, RNAs were treated with 1 U DNAse I (Gibco, Karlsruhe, Germany) per μg RNA for 15 min at room temperature. Purified RNA was reverse transcribed into cDNA using oligo-dT-primers and the SuperScript Preamplification-Kit (Gibco). PCR reactions were carried out in a total volume of 50 μl containing 400 nM of each primer, 200 μM of each dNTP (Pharmacia, Uppsala, Sweden), 50 mM KCl, 1.5 mM MgCl2, 10 mM Tris and 1 U Taq-Polymerase (Pharmacia). PCR was performed in a Peltier thermocycler (PTC-200, MJ Research, Watertown, MA) with primers and at the conditions indicated in table 1. All templates were initially denaturated for 5 min at 95°C and the amplification was followed by a final extension temperature of 72°C for 7 min. Changes in cell number of BON and STC-1 cells were determined by crystal violet staining after incubation with rising drug concentrations (IFNγ: 0–500 U/ml; MIBG: 0–100 μM) for up to 5 days. Measurements were performed as described . Cells were washed with PBS and fixed with 1% glutaraldehyde. After another washing step, cells were stained with 0.1% crystal violet. The unbound dye was removed by washing. Crystal violet that had absorbed onto the cells was solubilized with 0.2% Triton X-100. Then light extinction was analyzed at 570 nm using an ELISA reader. Cell cycle analysis was performed by the method of Vindelov and Christensen, as described previously . Cells were trypsinized, washed, and the nuclei were isolated using CycleTest PLUS DNA Reagent Kit (Becton Dickinson, Heidelberg, Germany). DNA was stained with propidium iodide according to the manufacturers' instructions. The DNA content of the nuclei was detected by flow cytometry and analyzed using CellFit software (Becton Dickinson, Heidelberg, Germany). To determine apoptosis the activity of caspase-3, a key enzyme in the apoptotic cascade was measured. Preparation of cell lysates and determination of caspase-3 activity was performed as described previously . The activity of caspase-3 was calculated from the cleavage of the fluorogenic substrate DEVD-AMC (Calbiochem-Novabiochem, Bad Soden, Germany). Cell lysates were incubated with substrate solution (caspase-3 substrate AC-DEVD-AMC 20 μg/ml, HEPES 20 mM, glycerol 10%, DTT 2 mM, pH 7.5) for 1 h at 37°C, and the cleavage of DEVD-AMC was measured fluorometrically with a VersaFluor fluorometer (excitation: 360 nm emission: 460 nm) from Biorad, Munich, Germany. Cells were seeded at a density of 5,000 cells/well into 96-well microtiter plates and incubated with IFNγ (0–500 U/ml) or MIBG (0–50 μM) or the combination of both. Release of the cytoplasmic enzyme lactate dehydrogenase (LDH), indicating cytotoxicity, was measured after 48 h of incubation by using the colorimetric kit from Roche as described elsewhere [20, 23]. Background release obtained by measuring LDH release of untreated cells was subtracted. Maximum release of LDH was obtained by adding 100 μl of 2% Triton X-100 to untreated cells. For determinations, 100 μl of each sample were transferred to a 96-well microtiter plate; 100 μl of LDH assay reagent were added to each well and incubated for 30 min at room temperature in the dark. The absorbance of samples was then measured at 490 nm. No significant LDH release was detected in the tissue culture medium alone nor in drug-containing incubation medium. The antineoplastic effects of the various substances and vehicles were compared by the unpaired, two-tailed Mann-Whitney U-test. The unpaired student t-test was used for cell cycle analysis. P values were considered to be significant at <0.05. If not stated otherwise, all functional experiments were performed in quadruplicate. To monitor IFNγ receptors (IFNγR) in human pancreatic carcinoid BON cells, mRNA expression of IFNγR was evaluated by RT-PCR. Using specific primers directed against the α-chain of the human IFNγR , we detected a robust expression of PCR-amplificates of the expected size (Fig. 1). The neuroendocrine-differentiated colorectal carcinoma cell line Colo320 DM served as a positive control. IFNγR expression in murine intestinal NE STC-1 tumor cells has already been demonstrated by cDNA array analysis . Expression of IFNγ receptors (IFNγR) in neuroendocrine gastrointestinal tumor cells. mRNA expression of IFNγR was evaluated in human pancreatic carcinoid BON tumor cells (lane 3). Neuroendocrine differentiated colorectal carcinoma cells (Colo320 DM) served as positive control for IFNγR (lane 4). β-actin was used as loading control (lane 1: BON, lane 2: Colo320 DM). PCR products were visualized by gel electrophoresis on an ethidium bromide-stained agarose gel. M: 100 bp DNA ladder. Changes in cell number induced by IFNγ were studied by performing crystal violet assays. IFNγ (0–500 U/ml) time- and dose-dependently inhibited the growth of both BON and STC-1 cells. After 5 days of incubation a decrease in cell number of up to 90% was observed in BON cells (Fig. 2a). In slower growing STC-1 cells a decrease of up to 75% was observed after 5 days of incubation (Fig. 2b). The IC50 values of IFNγ, determined after 72 h of incubation, amounted to 135 ± 10 U/ml in BON cells and 95 ± 15 U/ml in STC-1 cells. IFNγ-induced growth inhibition Rising concentrations of IFNγ for 5 days led to a time- and dose-dependent growth inhibition of neuroendocrine gastrointestinal tumor cells, as measured by crystal violet staining. The growth of BON tumor cells was inhibited with an IC50 value of 135 ± 10 U/ml (A). STC-1 cells displayed an IC50 value of about 100 U/ml (95 ± 15 U/ml) (B). Data are given as percentage of untreated controls (means ± SEM of 4 experiments). *, statistical significance (p < 0.05) compared to untreated controls. Recently, we showed that non-radiolabeled MIBG specifically inhibited the growth of norepinephrine transporter (NET)-expressing STC-1 tumor cells (IC50 ~ 8 μM) and that MIBG-treatment increased the expression of IFNγ receptors. Vice versa, IFNγ also enhanced MIBG-uptake . Hence, we additionally evaluated antiproliferative effects of a combination treatment of NE gastrointestinal tumor cells with IFNγ and MIBG. 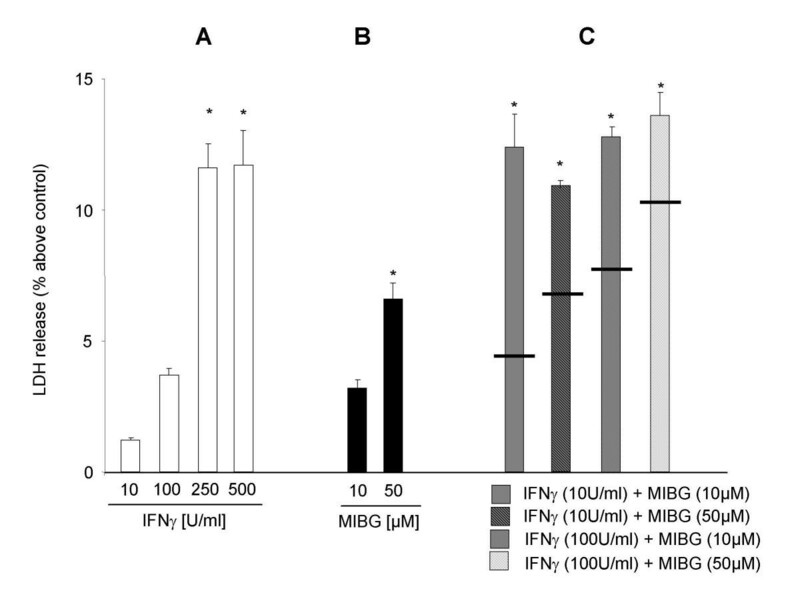 In STC-1 cells sub-IC50 concentrations of IFNγ (10–100 U/ml) and MIBG (1–5 μM) produced impressive additive growth inhibitory effects (Fig. 3a). The combination of 100 U/ml IFNγ with 5 μM MIBG decreased the proliferation of STC-1 cells by 95%. Such an antiproliferative effect was reached by MIBG alone only with concentrations of at least 25 μM. Antiproliferative effects of combination treatment with IFNγ and MIBG A combination treatment with sub-IC50 concentrations of IFNγ and MIBG for 72 h led to additive growth inhibitory effects in STC-1 (A) and BON cells (B). Black bars indicate the values of a calculated additive growth inhibition. Data are given as percentage of untreated controls (means ± SEM of 3 experiments). Using RT-PCR we also demonstrated the expression of plasma membrane bound NET in BON cells which had not yet been investigated with regard to NET expression (Fig. 4a). Proliferation assays revealed that MIBG (1–100 μM) dose- and time-dependently inhibited the growth of BON cells by up to 68 ± 3.4%. The IC50 value of MIBG, determined after 48 h of incubation, amounted to 47.4 ± 2.1 μM being distinctly higher than in STC-1 cells. Pretreating BON cells with IFNγ (10–500 U/ml) influenced the expression of MIBG-transporting NET. Semiquantitative RT-PCR revealed an IFNγ-induced increase of NET expression in BON cells by up to 200% after 48 h (Fig. 4b). However, upregulation of NET expression did not result in an overadditive antiproliferative effect of IFNγ (10–100 U/ml) plus MIBG (10–20 μM). Like in STC-1 cells, additive antiproliferative effects of IFNγ and MIBG were observed in BON cells (Fig. 3b). The combination of 100 U/ml IFNγ with 10 μM MIBG produced antiproliferative effects that were comparable to those achieved by 50 μM MIBG on its own. mRNA expression of human norepinephrine transporters (hNET) mRNA expression of norepinephrine transporters was evaluated in BON cells. A: Transcripts specific for hNET were detected by RT-PCR (lane 1). β-actin was used as loading control (lane 2). 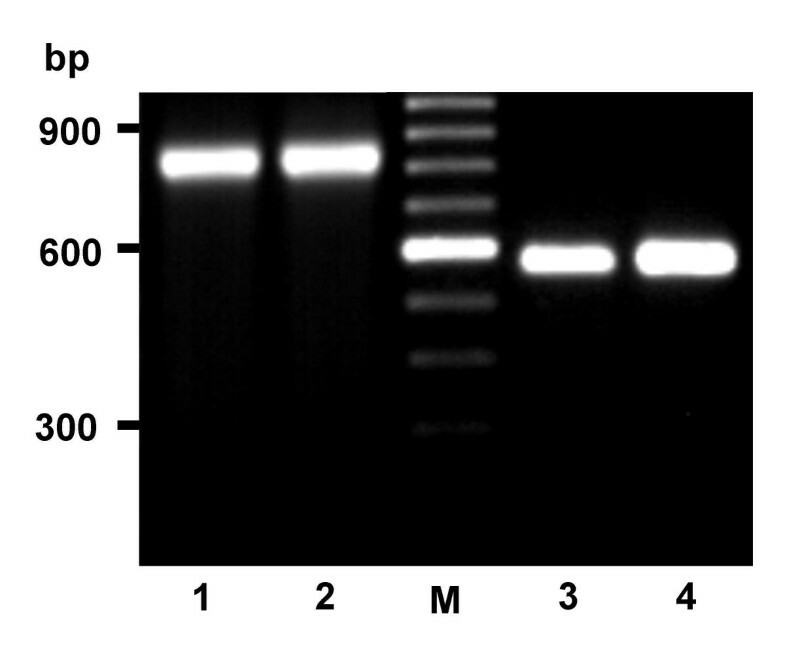 PCR products were visualized by gel electrophoresis on an ethidium bromide-stained agarose gel. M: 100 bp DNA ladder. B: Up-regulation of hNET expression by IFNγ. 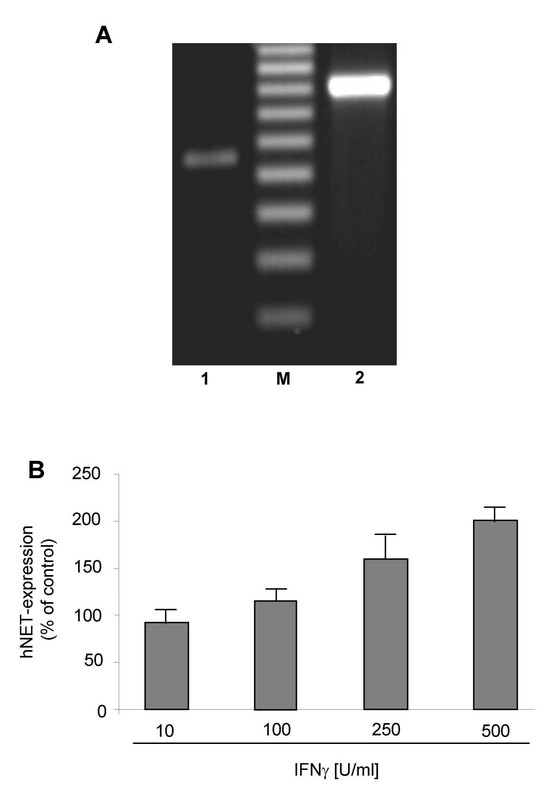 Semi-quantitative RT-PCR revealed a dose-dependent induction of hNET expression in BON cells by IFNγ after 48 h. Data are given as means ± SEM of 2 experiments. Flow cytometric analysis revealed that challenging BON cells for 48 h with rising concentrations of IFNγ (0–500 U/ml) dose-dependently arrested the cells in the S-phase of the cell cycle, thereby decreasing the proportion of cells in the G2/M-phase. S-phase arrest was significant for 250–500 U/ml IFNγ (Fig. 5). The effect of MIBG treatment on the cell cycle of BON cells was also evaluated. In contrast to slow-growing STC-1 cells, not displaying cell cycle arresting effects in response to MIBG-treatment , BON cells showed a significant and dose-dependent arrest in the G0/G1-phase of the cell cycle after treatment with MIBG (10–50 μM). Accordingly, the proportion of cells in the G2/M-phase decreased. Induction of cell cycle arrest by IFNγ and MIBG After 48 h of incubation IFNγ dose-dependently induced an arrest in the S-phase of the cell cycle of BON cells. Accordingly, the proportion of cells in the G2/M-phase decreased. Differences in the proportion of cells in the respective phase of cell cycle versus control were significant from 250 to 500 U/ml IFNγ (p < 0.05). Incubation of BON cells with MIBG for 48 h induced a dose-dependent arrest in the G0/G1-phase, while the proportion of cells in the G2/M-phase decreased. Differences in the proportion of cells in the respective phase of cell cycle versus control were significant at 10 and 50 μM MIBG (p<0.05). Combination treatment of MIBG and IFNγ abolished MIBG-induced G0/G1-phase arrest. Means of 4 independent experiments are shown. 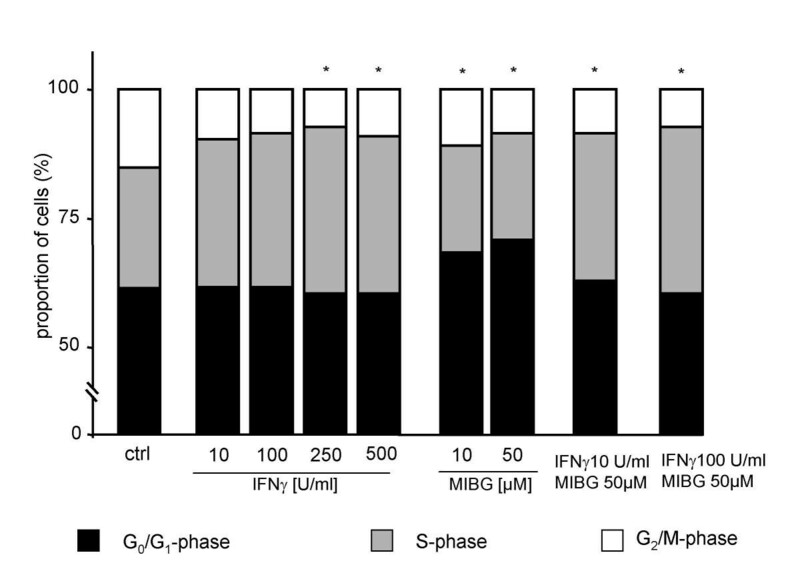 Co-application of IFNγ (10–100 U/ml) and MIBG (50 μM) resulted in an abrogation of the MIBG-induced G0/G1-phase arrest, while the proportion of cells in the S-phase significantly increased as compared to MIBG-treatment alone. Interestingly, the S-phase arrest induced by combination treatment with 100 U/ml IFNγ and 50 μM MIBG was as strong as the one achieved by 500 U/ml IFNγ alone (Fig. 5). To check whether an induction of programmed cell death contributed to the antineoplastic effects of IFNγ, we investigated IFNγ-induced activation of caspase-3, a key enzyme in the apoptotic signaling pathway. Above 10 U/ml IFNγ induced caspase-3 activation in both STC-1 and BON cells after 48 h of incubation (Fig. 6a). No significant increase in IFNγ-induced caspase-3 activity was observed at concentrations higher than 100 U/ml or 250 U/ml IFNγ. Unexpectedly, co-treatment with IFNγ (10–100 U/ml) plus MIBG (1–2 μM for STC-1 cells; 10–20 μM for BON cells) led to subadditive caspase-3 activation in either BON or STC-1 cells (Fig 6b,6c). Induction of apoptosis by IFNγ and MIBG A: IFNγ induced apoptosis specific caspase-3 activity in BON and STC-1 cells after 48 h of incubation. B: MIBG-treatment (48 h) dose-dependently increased caspase-3 activity of BON cells. Interestingly, combination treatment with IFNγ and MIBG resulted in sub-additive caspase-3 activation. Black bars indicate the calculated additive values of caspase-3 activation of either combination. C: MIBG-treatment (48 h) dose-dependently increased caspase-3 activity of STC-1 cells. Co-incubation with IFNγ and MIBG led to sub-additive caspase-3 activation. Black bars indicate the calculated additive values of caspase-3. Data are given as means ± SEM of 3 (STC-1) or 4 (BON) independent experiments. *, statistical significance (p < 0.05) compared with untreated controls. Cytotoxic loss of cellular membrane integrity was measured by LDH release assay. Incubating BON cells with 10–500 U/ml IFNγ for 48 h resulted in a pronounced and dose-dependent increase in LDH release (Fig. 7a). Additionally, we analyzed MIBG-induced cytotoxicity in BON cells. Treatment with MIBG for 48 h also dose-dependently increased the LDH-release of BON cells (Fig. 7b). 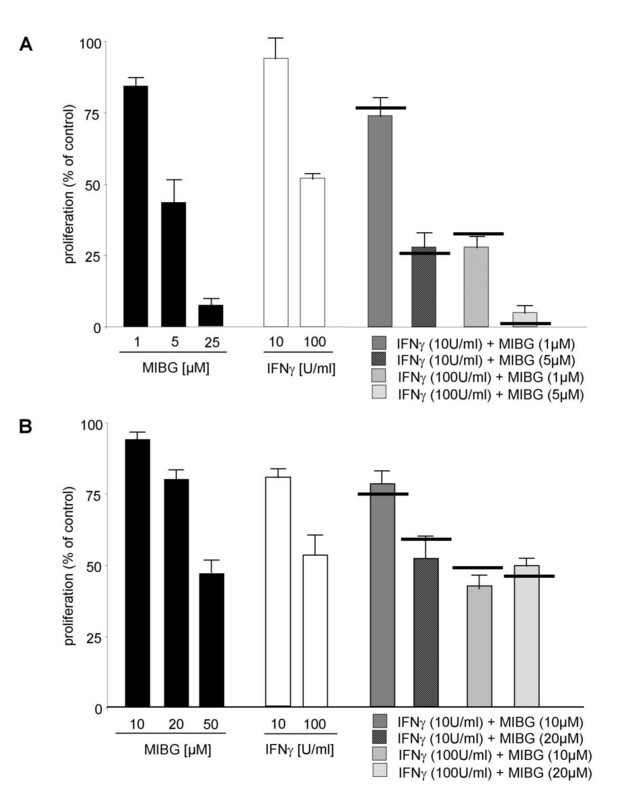 The combination of IFNγ (10–100 U/ml) and MIBG (10–50 μM) resulted in a marked overadditive LDH release from BON cells (Fig. 7c). Compared to the calculated values of an assumed additive cytotoxicity (indicated as black bars in the columns of Fig. 7c), the actual LDH-release induced by 100 U/ml IFNγ plus 50 μM MIBG was about 32 ± 4% higher than the calculated sum. The combination of the lowest doses of IFNγ (10 U/ml) and MIBG (10 μM) surmounted the calculated sum of each effect by 188 ± 12%. Thus, the cytotoxic effect of a "low-dose combination" of IFNγ and MIBG was as pronounced as the one obtained by 500 U/ml IFNγ alone. IFNγ induced cytotoxicity. Cytotoxicity of IFNγ was evaluated by lactate dehydrogenase (LDH) release from IFNγ-treated BON cells. A: After 48 h of incubation, IFNγ induced a dose-dependent increase in LDH release. B: MIBG-treatment (48 h) also induced cytotoxicity in BON cells in a dose-dependent manner. C: Interestingly, co-treatment of BON cells with IFNγ and MIBG resulted in an over-additive LDH release. Black bars indicate the calculated additive values of LDH release of either combination. Data are given as the relative increase in LDH release compared to untreated controls (means ± SEM of 4 independent experiments). *, statistical significance (p < 0.05) compared with untreated controls. Although excellent control of tumor-associated hypersecretion syndromes of neuroendocrine gastrointestinal tumors can be achieved by biotherapy with somatostatin analogs or IFNα, systemic treatment options to inhibit the growth and further spread of metastatic neuroendocrine tumors are still unsatisfactory. For instance, IFNα although excellently controling hypersecretion in most cases , has been shown to cause only a partial tumor remission in less than 20% of treated patients [1, 7, 26]. Novel treatment modalities are therefore needed. Here, we report on the antineoplastic effects of IFNγ, a cytokine which has already been shown to exert growth inhibitory effects in vitro in several non-neuroendocrine cancer models, including breast , hepatocellular , ovarian  and colorectal carcinoma [30, 31] or glioblastoma . Also in vivo, IFNγ has been demonstrated to be beneficial as a first line therapeutic agent for ovarian cancer  or as a supportive drug for enhanced chemoimmunotherapeutic regimes of metastatic melanoma . Nevertheless, in other cancers (i.e., renal cell carcinoma or SCLC) IFNγ did not show any appreciable beneficial antineoplastic action in man [35, 36], arguing for a distinctive tumor species-dependent effect of the cytokine. As IFNγ-mediated growth control of a particular tumor type does apparently not allow to predict similar effects in other tumor species, it was all the more important to investigate IFNγ's antineoplastic action in neuroendocrine gastrointestinal tumor cells. Here we provide evidence that IFNγ potently inhibits growth of neuroendocrine gastrointestinal tumor cells. When IFNγ was combined with MIBG, an even more pronounced antiproliferative effect was obtained. As the growth pattern of NE gastrointestinal tumors exhibits a wide spectrum ranging from very slow to fast growing types , it was important to study IFNγ-induced growth inhibition in NE tumor cell lines with different growth characteristics and of different origin. We chose two models of NE gastrointestinal tumor disease: First, human pancreatic carcinoid BON cells with a doubling time of 34 h, and second, NE tumor cells of the gut (STC-1 cells) with a doubling time of 54 h . In either NE tumor model we observed growth inhibitory effects of IFNγ with IC50 values of about 100 U/ml and maximal growth inhibition by 75–90% at ≥250 U/ml IFNγ. As these concentrations are within the therapeutically achievable range of IFN-plasma levels in humans , IFNγ appears to be a promising agent for innovative growth inhibition of NE gastrointestinal tumor cells. The signaling pathways mediating IFNγ's antineoplastic action differ between various tumor types and lead to distinct biological responses, such as G1-arrest , S-phase arrest [40, 41], induction of apoptosis [24, 28] and cytotoxicity . To further characterize the antiproliferative action of IFNγ in NE gastrointestinal tumor cells, we performed cell cycle analyses. Flow cytometry with isolated nuclei of IFNγ-treated BON tumor cells, revealed a significant increase in the proportion of cells in the S-phase. Cell cycle arrest by IFNγ in the S-phase had previously been described for other tumors such as glioblastomas , but other reports described a G0/G1-arrest in response to IFNγ treatment [6, 7, 43]. The accumulation of NE gastrointestinal tumor cells in the S-phase of the cell cycle may be of great value for novel combination treatments with established antimetabolic chemotherapeutics such as 5-fluorouracil, which interfere with DNA-synthesis . Thus, the S-phase arresting cytostatic drug irinotecan enhances the antiproliferative efficacy of 5-fluorouracil in colon cancer . Moreover, we observed an induction of apoptosis in neuroendocrine gastrointestinal tumor cells by IFNγ. Concerning the underlying mechanisms of IFNγ-induced apoptosis both indirect mechanisms like an increase in TNF-α sensitivity , an upregulation of CD95 receptor expression  or a modulation of human leukocyte antigen molecules (HLA) , and direct mechanisms like the upregulation and activation of caspases have been shown [24, 49]. In BON and STC-1 cells we found a dose-dependent induction of apoptosis via proapoptotic caspase-3 activation. This direct mechanism has been previously described by Detjen et al. in neuroendocrine QGP-1 tumor cells. In OGP-1 cells IFNγ-mediated apoptosis was found to require intermediate signaling steps such as induction of the interferon regulatory factor IRF-1 and subsequent activation of the initiator caspase-1, which accounted for the relatively long time to response of IFNγ-induced apoptosis. Caspase-1-mediated activation of downstream caspases in response to IFNγ has been reported for other cell models, like leukemia cells , vascular smooth muscle cells  and HeLa cells . It is intriguing to speculate, that also in the BON and STC-1 tumor models IFNγ-mediated apoptosis involved such intermediary signaling steps, since caspase-3 activation in BON and STC-1 cells was not detectable earlier than after 48 h of incubation with IFNγ. In order to fully understand the signaling events of IFNγ-induced apoptosis in neuroendocrine tumor cells further investigations are required. Growth inhibition of NE tumor cells by IFNγ also involves cytotoxcicity. At least at high concentrations of IFNγ, BON cells displayed a significant increase in LDH release. Interestingly, at the half-maximal growth inhibitory IFNγ concentration of 100 U/ml neither a significant increase in cytotoxicity nor a significant S-phase arrest could be observed, and only caspase-3 activity was significantly increased. Thus, at lower concentrations IFNγ appears to control growth of NE tumor cells mainly by apoptosis, whereas at higher concentrations other mechanisms are involved. The second goal of our study was to explore the growth inhibitory effects of a combination treatment of IFNγ and non-radiolabeled meta-iodobenzylguanidine (MIBG). The rationale for investigating this particular combinbation was first, that non-radiolabeled MIBG was a potent NE tumor-specific antineoplastic drug [11, 38], and second, that IFNγ enhanced the uptake of MIBG by increasing the expression of norepinephrine transporters in neuroblastoma cells . Moreover, we recently showed that MIBG induced an overexpression of IFNγ-receptors in NE gastrointestinal tumor cells . These results suggested possible synergistic action of a combination treatment of IFNγ and MIBG. Intriguingly, combining sub-IC50 concentrations of IFNγ and MIBG led to growth inhibition of up to 95%. In STC-1 cells, the combination of IFNγ and MIBG exeeded the maximal antiproliferative effect of IFNγ alone by more than 20%. To achieve 90% growth inhibition of STC-1 cells by MIBG alone, concentrations beyond 25 μM were needed. Thus, combining IFNγ and MIBG allows to reduce the concentration of either agent to one fifth without losing excellent growth control. The same holds true for BON cells, which also displayed enhanced growth inhibition in response to sub-IC50 concentrations of IFNγ and MIBG. The potential of this novel combination treatment strategy will have to be evaluated in future clinical studies. To further investigate underlying mechanisms of the proposed combination therapy, we evaluated IFNγ-induced norepinephrine transporter expression, apoptosis, cell cycle regulation and cytotoxicity in BON cells. Our results indicate that an overexpression of norepinephrine transporters does not account for enhanced growth inhibition by IFNγ plus MIBG. Although IFNγ induced the expression of norepinephrine transporters (NET) in neuroendocrine gastrointestinal tumor cells, the IFNγ concentrations required to achieve a marked increase in NET expression were far above the antiproliferative IC50-value of about 100 U/ml. Hence, our data indicate that an enhanced MIBG-uptake due to an IFNγ-induced overexpression of NET cannot be achieved with IFNγ concentrations, suitable for combination treatment. Unexpectedly, the combination of MIBG and IFNγ resulted in a sub-additive caspase-3 activation as compared to treatment with either drug alone. Furthermore, we found an abrogation of MIBG-induced G0/G1-phase arrest in BON cells that had been co-treated with S-phase arresting IFNγ. Thus, MIBG and IFNγ appear to modulate distinct signaling pathways to induce apoptosis and cell cycle arrest in NE tumor cells. Due to yet unknown interferences in the signaling events, the effects on apoptosis and cell cycle were less pronounced and even sub-additive. Thus, it will be of future interest to identify the signaling molecules involved in this interference to gain insight into the underlying regulatory processes at the molecular level. However, sub-additive cell cycle arrest has already been found for other drug combinations, like the combination of 5-fluorouracil and cisplatin in colon cancer. In contrast to our findings the sub-additive cell cycle arrest of 5-fluorouracil and cisplatin led to a reduced growth inhibition than with 5-fluorouracil alone . Despite of the reduced apoptosis and cell cycle arrest the growth inhibition obtained by IFNγ plus MIBG was additive in NE tumor cells. The most likely explanation of these conflicting results is a synergistic increase in cytotoxicity in resopnse to IFNγ plus MIBG. While almost no cytotoxicity was seen for either drug alone, the combination of low doses of MIBG and IFNγ led to a pronounced and significant synergistic increase in cytotoxicity. Concentrations as high as 500 U/ml were needed to achieve comparable cytotoxic effects by IFNγ alone. The underlying mechanisms are yet unknown, but have to be studied in the future. Anyway, the very fact, that co-treatment of NE tumor cells with IFNγ and MIBG exerts such a pronounced cytotoxic effect may be of potential clinical value: As the expression of MIBG-transporting norepinephrine transporters in extraneuronal locations is limited or low (e.g., heart, renal medulla, lung endothelial cells), the relative specific and exclusive NET (over)expression in neuroendocrine gastrointestinal tumor cells forms a basis for NE tumor-targeted treatment . Thus, a low concentration of MIBG renders an ineffective concentration of IFNγ cytotoxic in NE tumor cells. It can therefore be speculated that the combination of IFNγ with MIBG may induce a NE tumor cell-specific killing with reduced side-effects in normal cells. Future clinical studies will have to clarify the actual effects in vivo. Our study provides evidence that IFNγ induces both cell cycle arrest and apoptosis in NE gastrointestinal tumor cells. Moreover, IFNγ can be effectively combined with non-radiolabeled MIBG in order to achieve excellent growth control at low concentrations of either drug. Thus, IFNγ represents a promising novel drug to be tested in patients with metastatic NE gastrointestinal tumor disease. We thank Antje Krahn and B. Ergün for excellent technical assistance. We are indebted to the Institute of Physiology, Charité University Medicine Berlin, Germany, for laboratory facilities. This study was supported by grants of the Deutsche Forschungsgemeinschaft and the Sonnenfeld-Stiftung. MH : writing, study design, experimental design, investigation of growth inhibition and apoptosis; APS: cell cycle analysis by flow cytometry; AH: cytotoxicity studies; G A-H: RT-PCR, interpretation of the data; HS: study design, writing. All authors read and approved the final manuscript.